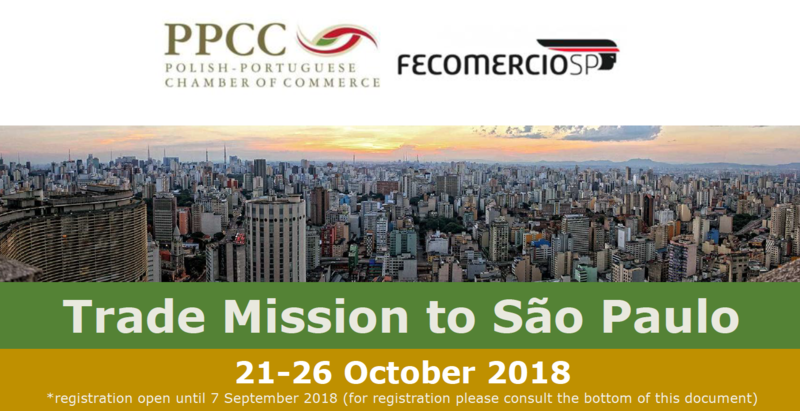 The Polish-Portuguese Chamber of Commerce (PPCC) is organizing a multi-sector trade mission to Sao Paulo (Brazil) that will take place on 21th-26th October 2018. This trade mission is a great opportunity to get to know the business environment in Brazil, and accurately assess business opportunities in that market. The mission will be particularly focused on B2B meetings with pre-selected companies and key players in each participant’s activity sector. We would like to encourage all the companies interested in exporting to-, importing from-, or investing in Brazil to take part in this trade mission. PPCC will contact all the companies that express their initial interest in the Trade Mission to Sao Paulo. The registration is open until 7th September 2018.